The ruling, a narrow victory for critics of the law, prolonged a long-winding legal battle over legislation that some called the strictest in the nation. The New Orleans-based court’s decision sends the case back to a lower court, which will decide whether lawmakers intended to discriminate when they approved the law. In October, U.S. District Judge Nelva Gonzales Ramos of Corpus Christi ruled that Texas’ voter ID law “constitutes an unconstitutional poll tax.” The state appealed the ruling to the 5th Circuit, arguing that the law improves ballot security and prevents election fraud. For the reasons stated above, we VACATE the district court’s judgment that SB 14 was passed with a racially discriminatory purpose and REMAND for further consideration of Plaintiffs’ discriminatory purpose claims, using the proper legal standards and evidence. We VACATE the district court’s holding that SB 14 is a poll tax under the Fourteenth and Twenty-Fourth Amendments and RENDER judgment for the State on this issue. We need not and do not address whether SB 14 unconstitutionally burdens the right to vote under the First and Fourteenth Amendments; therefore, we VACATE the district court’s judgment on that issue and DISMISS those claims. We AFFIRM the district court’s finding that SB 14 violates Section 2 of the Voting Rights Act through its discriminatory effects and REMAND for consideration of the appropriate remedy. Finally, on remand, the district court should: (1) give further consideration to its discriminatory purpose findings as specified herein; and (2) if the district court does not find that SB 14 was imposed with a discriminatory purpose, consider what remedy it should grant due to SB 14’s discriminatory effect in violation of Section 2 of the Voting Rights Act, taking account of any impact of SB 983 and this opinion. Accordingly, if on remand the district court finds that SB 14 has only violated Section 2 through its discriminatory effects, it should refer to the policies underlying SB 14 in fashioning a remedy. Clearly, the Legislature wished to reduce the risk of in-person voter fraud by strengthening the forms of identification presented for voting. Simply reverting to the system in place before SB 14’s passage would not fully respect these policy choices—it would allow voters to cast ballots after presenting less secure forms of identification like utility bills, bank statements, or paychecks. See TEX. ELEC. CODE § 63.001(b) (West 2010). One possibility would be to reinstate voter registration cards as documents that qualify as acceptable identification under the Texas Election Code. The court could also decree that, upon execution of an affidavit that a person does not have an acceptable form of photo identification, that person must be allowed to vote with their voter registration card. Cf.TEX. ELEC. CODE §§ 63.008, 63.0101 (West 2010) (allowing a person to present alternate forms of identification upon submitting an affidavit certifying they did not have their voter registration card in their possession). Such a remedy would respect the Legislature’s choice to do away with more problematic forms of identification, while also eliminating SB 14’s invalid applications. See Ayotte, 546 U.S. at 331 (“So long as they are faithful to legislative intent, then, in this case the lower courts can issue a declaratory judgment and an injunction prohibiting the statute’s unconstitutional application.”). However, we recognize that the district court must assess this potential solution in light of other solutions posited by the parties, including other forms of photo identification. We urge the parties to work cooperatively with the district court to provide a prompt resolution of this matter to avoid election eve uncertainties and emergencies. From there he gets into the details. The main loss from the plaintiffs’ perspective is that the vacate/remand on discriminatory intent means that there isn’t (yet) a basis to bail Texas back in to needing preclearance under Section 3 of the Voting Rights Act. That could still happen under the re-review, but the standard for such a ruling is tougher now. Practically speaking, getting back to where your voter registration card suffices as your voter ID card, which is most of what we had before, seems like a pretty good outcome to me. I don’t know what the timeline is at this point, and I presume the earlier rulings that allowed the voter ID law to be enforced for the 2014 election is still in place. It’s still a good result. I’ve received numerous statements and press releases on this, which I’ve included beneath the fold. In the meantime, go read the ruling yourself. There are parts the non-lawyers can and will skim over, but for the most part it’s pretty comprehensible. Read it, or just read Prof. Hasen’s analysis, and see what you think. Daily Kos, ThinkProgress, the Brennan Center, the Press, Texas Leftist, Paradise in Hell, the Texas Election Law Blog, and Newsdesk have more. NEW ORLEANS, LOUISIANA – Today, the United States Court of Appeals for the Fifth Circuit affirmed a district court’s finding that Senate Bill 14 of the 82nd Regular Session, the “Voter ID” legislation, violates the Voting Rights Act through its discriminatory effects. The Court also remanded the case back to the district court for reconsideration of the plaintiffs’ discriminatory purpose claims and for a decision on the remedy to the Section 2 violation. Today, a three-judge panel of the U.S. Fifth Circuit Court of Appeals upheld a previous ruling by U.S. District Judge Nelva Gonzalez Ramos finding Texas’s photo/voter identification law, Senate Bill 14, violates Section 2 of the Voting Rights Act of 1965. Last October, after hearing arguments over a nine-day trial in Corpus Christi, Judge Ramos of the Southern District of Texas blocked the photo ID law on the grounds that it creates an unconstitutional burden on the right to vote. The District Court noted that SB 14 “constitutes an unconstitutional poll tax” and was “imposed with an unconstitutional discriminatory purpose” with a discriminatory effect on African American and Hispanic voters in Texas. Today’s ruling by the Fifth Circuit is a major victory for the Mexican American Legislative Caucus, for voting rights advocates across the country, and most importantly, for Texas voters and the fight to secure free and fair elections in our state. “There is no more fundamental American right than the right to vote. Time and time again, the courts have found Texas’s voter ID law to have a discriminatory effect against Texas Latino and African American voters. I applaud the Fifth Circuit Court for identifying that the state of Texas enacted election reforms that are nothing more than voter suppression tactics. 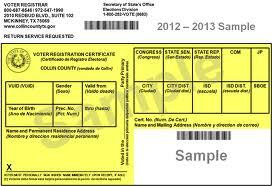 Today, August 5th, the U.S. 5th Circuit Court of Appeals struck down Texas’s discriminatory voter ID law. “This is a true victory for all Texans. Texas’ Voter ID law was discriminatory pure and simple and was nothing more than a ploy to deny certain Texans the ability to exercise their constitutional right to vote. “We are elated that on the eve of the Voting Rights Act 50th anniversary, the country’s most conservative appeals court struck down Texas’ discriminatory voter ID law. “We’ve always maintained that the law was a solution for a problem that didn’t exist. Voter fraud is about as true as Gov. Greg Abbott’s fear that Jade Helm 15 is a covert plan by the federal government to take over our state. “What the law did do is strip hundreds of thousands of voters of color of their right to vote, just as the authors of the law intended. In Texas, we have too many barriers to the ballot box, which is why we have among the lowest voting rates in the country. I support the Fifth Circuit Court of Appeals finding that the Texas photo ID requirements to vote are in violation of the Voting Rights Act. This is now the third court to find this law, passed in 2011, discriminatory and in violation of the Voting Rights Act. The appellate court agreed with the lower court’s finding of a stark racial disparity between those who possess or have access to ID, and those who do not. Attorney General Ken Paxton and Governor Greg Abbott should not continue to spend taxpayer money to defend a law that has continually been found to hurt minority voting rights. It’s incumbent on them to work with the plaintiffs in this case, including the Mexican American Legislative Caucus, on a remedy that will not disenfranchise eligible voters. The Court even provided some suggestions such as allowing the voter registration card as an acceptable form of ID. I urge the Attorney General and Governor to fulfill their legal duties and stop the implementation of this discriminatory law immediately. Today’s decision is not the end of this struggle. The right to vote must be constantly defended. I look forward to future elections where more Texans, regardless of race, age, poverty level or education level, are able to participate more freely in the vote. August 6th marks the 50th anniversary of the Voting Rights Act which was signed into law by President Lyndon B. Johnson. Most notably, the Act has accomplished greater access to the ballot box by eliminating obstacles used to keep racial and ethnic minorities from registering to vote.